With just over one year before Korea hosts the ‘Pyeongchang 2018 Winter Olympics’; the Korea Tourism Organisation is already counting down to this global event which will be a key focus for us as we move into 2017. In anticipation of 2018 and to celebrate another fantastic year for the Korea Tourism Organisation we have created a ‘Pyeonchang Winter Olympic Continue Reading	. . .
Lonely Planet’s Best in Travel 2017 is the highly anticipated collection of the world’s hottest trends, destinations and experiences for the year ahead. The bestselling, inspirational travel yearbook from the world’s leading travel authority highlights the top ten countries, cities, regions and best value destinations that Lonely Planet’s experts recommend travellers experience in 2017. We are delighted to announce that Continue Reading	. . .
Korea Inbound Tourism Projected to Grow by 20% in 2016 South Korea is expected to shatter its annual visitor arrival this year, having already recorded around 8.1 million foreign visitors during the first half of 2016. While Korea continues overseas marketing efforts throughout the year, niche tourism sectors such as the MICE industry are expected to significantly contribute to the Continue Reading	. . . The Ministry of Culture, Sports & Tourism (Minister Kim Jongdeok) and Korea Tourism Organization (CEO Jung Chang Soo) are proud to present a new international advertisement in mid-August, showing Korea’s creative beauty on major TV channels throughout the world, as well as online and through social media networks. The new commercial features ‘Descendants of the Sun’ actor and top Continue Reading	. . . Following a meeting by their respective Tourism Ministers earlier this year, The London offices of the China National Tourist Office, The Japan National Tourism Organisation and the Korea Tourism Organisation have announced a partnership to co-promote their destinations under a campaign called Visit East Asia. In a joint statement issued at the signing of the Memorandum of Understanding outlining Continue Reading	. . .
Lonely Planet, the world’s leading travel media company, has today announced its inaugural Best in Asia list – an agenda-setting collection of the continent’s 10 best destinations to visit over the next 12 months. 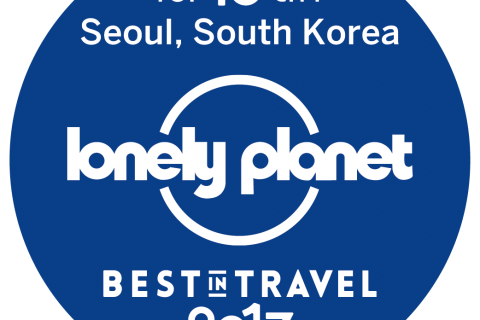 For this first-ever Best in Asia list, Lonely Planet’s in-house Asia experts have named Jeonju, South Korea within their top three. “In compiling our Best Continue Reading	. . .
From June to August Korea has some fabulous festivals across all of the summer months. This is the season for fun with all your family and friends; Korea has many diverse options to experience and keep everyone occupied. Whichever part of Korea you visit, you can be pretty sure that there will be some event or festival to enjoy. Maybe Continue Reading	. . . Enjoy Korean History Experience at Historical Sites Photo: Reenactment of watch guards ceremony at Sungnyemun Gate (left) / Gungnamji Pond (right) Want to learn more about Korean history? How about a Korean history experience at the historical sites? The ‘Reenactment of Watch Guards Ceremony’ event held at National Treasure No.1, Sungnyemun Gate, is finally resuming since its damage from a Continue Reading	. . .
High Ambitions for Alpine Glory South Korea is not yet a top of mind winter sports destination, but industry members hope that the 2018 Winter Olympics will showcase the country’s finess in this area. Source: TTG MICE Magazine, May 2016 edition, page 23.	. . .
Actor Song Joong-ki from ‘Descendants of the Sun’ New face of Korean Tourism for 2016! Captain Yoo Si-jin is officially the Korean Tourism Honorary Ambassador for 2016, and will be carrying out TV commercials and various Korean tourism promotional activities. Lead actor Song Joong-ki from the latest Korean drama ‘Descendants of the Sun’ has been appointed to be the Korea Continue Reading	. . .